Even if you are not a student of history, you have probably heard about the “fireside chats” that President Franklin Roosevelt conducted during his presidency. Until recently when I researched these radio broadcasts, I thought they were a “regular” part of his administration. By “regular” I assumed they occurred on a weekly or perhaps monthly basis. As it turns out there were only thirty-one of these chats between 1933 and 1944, all broadcast during the evening hours (after supper). 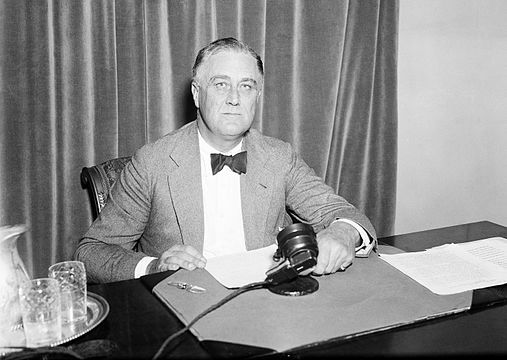 During his first term, President Roosevelt used the radio to address the American public directly about serious issues such as the banking crisis and his New Deal solutions as well as ongoing policy changes. 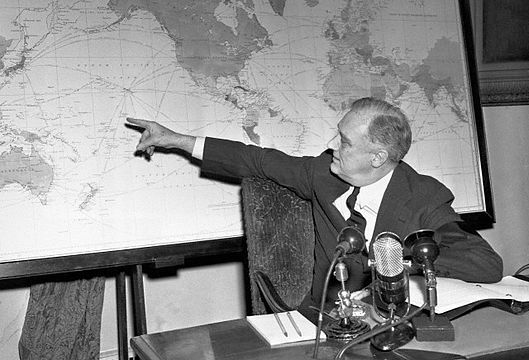 After the attack at Pearl Harbor, he took to the airwaves on December 9, 1941 to inform and reassure U.S. citizens. The idea behind the chats was to communicate encouragement during times of extreme uncertainty and distress. FDR’s tone and demeanor was calm as he spoke, giving facts and figures while assuring the American people, he and the government had a handle on each situation. He was the first president to use the radio industry in this way. The term “fireside chat” was coined by CBS broadcast executive Harry Butcher in a press release before the May 7, 1933 address. It was inspired FDR’s press secretary Stephen Early who said that the president liked to think of his audience as a few people seated around his fireside. Listeners were able to picture the president in his study, in front of his fireplace and imagine themselves sitting beside him. These images and the familiar way Roosevelt spoke (referring to the audience as “my friends” and himself as “I”) made the president a “man of the people,” and his popularity soared. June 12, 1944 is the date of his last chat during which he spoke about the invasion in Normandy, the need to continue to support the war effort through the purchase of war bonds, and the Pacific campaigns.